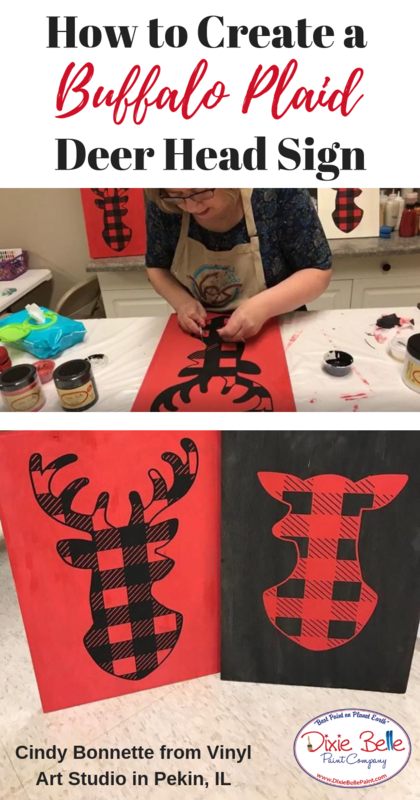 Cindy Bonnette from Vinyl Art Studio in Pekin, IL is demonstrating this fully painted Buffalo Plaid Deer Head Sign, painted on wood using a stencil to create the image. All products used are Dixie Belle Paint Company! Cindy Bonnette from Vinyl Art Studio in Pekin IL! 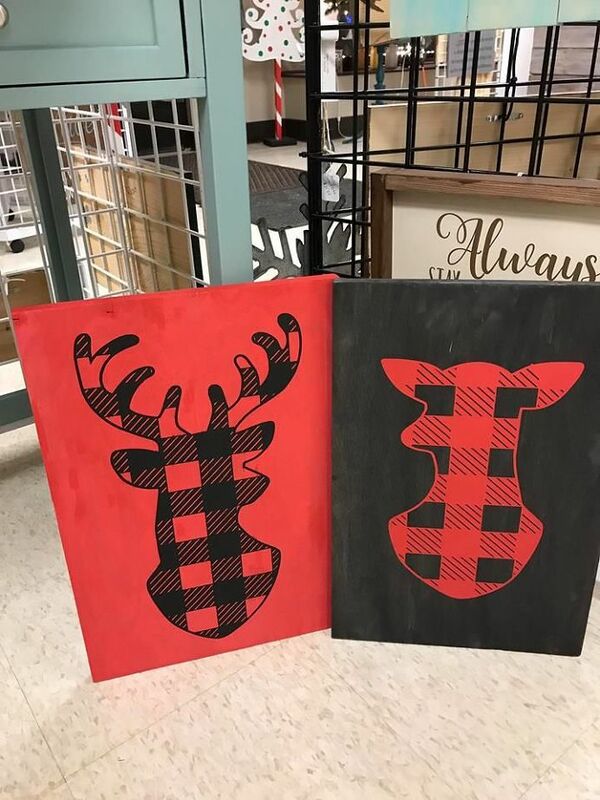 Demonstrating this fully painted Buffalo Plaid Deer Head Sign, painted on wood using a stencil to create the image. All products used are Dixie Belle Paint Company! With a single board of oak plywood, start out by painting the background Cindy usually start with the edges. She is painting with the Dixie Belle Blue Sponge because it smooths the paint out great, but you can use a brush if you prefer. The paint doesn’t need to be thick and heavy, a nice even coat is all you need. Using Dixie Belles Honky Tonk Red Cindy watered it down just a little bit, she likes to thin it down for the background, but watering the paint down is optional. Dixie Belle has great coverage; therefore, it should take only one coat to cover the board. 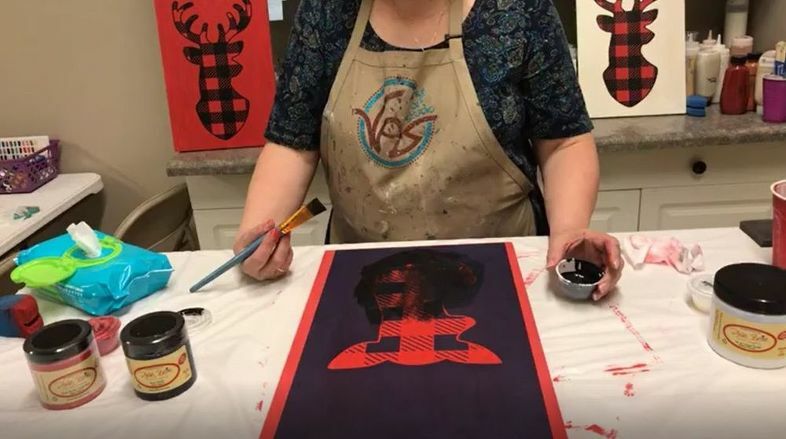 Working with a stencil is known for having some bleeding issues, some of the steps we take are to alleviate these issues the best we can, as much as possible. 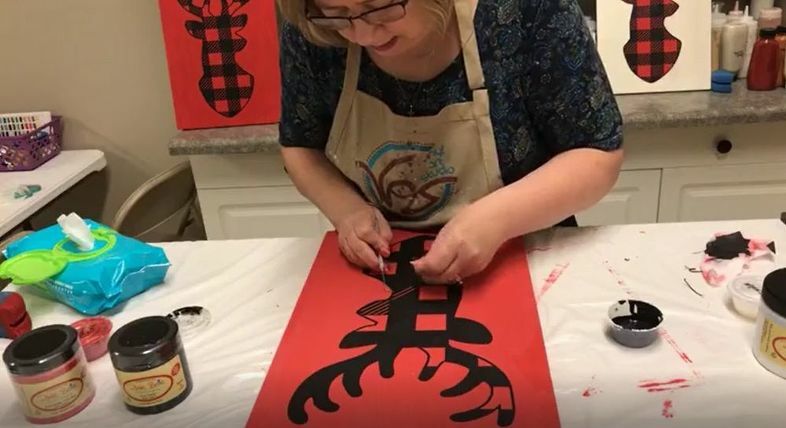 Once we have the background is painted and dried, use sand paper to scuff sand the surface this will help the stencil adhere and helps to stop bleeding under the stencil. Now you can apply your stencil. Cindy usually tapes the stencil in place, with painters tape make a hinge on the top. 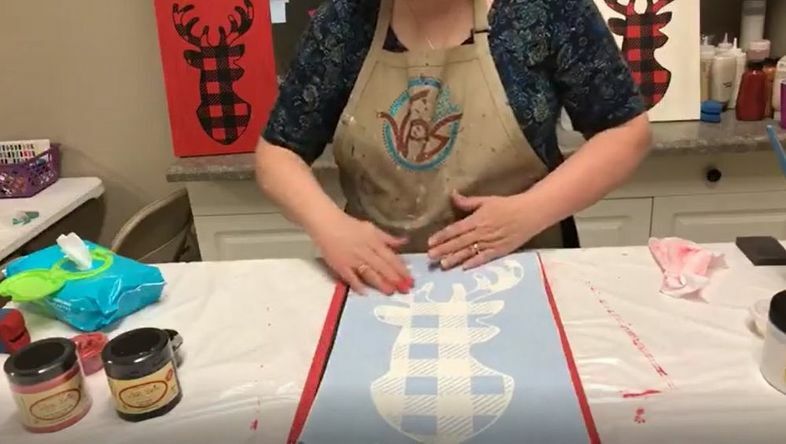 The stencil is a single use stencil and comes with an adhesive back, start by peeling the backing off. Smooth it down and make sure it all of the stencil comes off the backing. 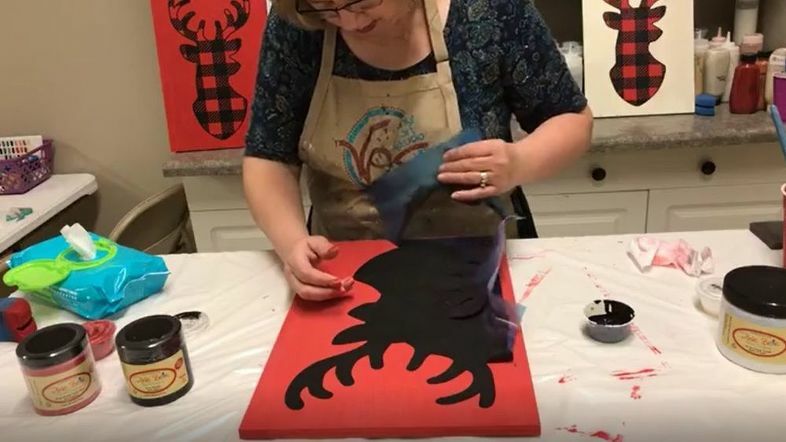 Vinyl cutouts usually have separate pieces, work with it gently and rolling it will help. Once the backing is off smooth the stencil down onto the wood and peel the front layer off the vinyl stencil. Once we get the stencil on our board, make sure there is no bubbles around the edges of the stencil. Put a coat of sealer down, use Dixie Belles Top Coat in Satin. It does not take very much, a very very thin coat, a little goes a long way. Don’t panic if you make a mistake everything is touch-up-able! Once the Clear Coat is dry paint a layer of Dixie Belle Paint Color Caviar, work the paint on top of the stencil. This will take 2 coats of paint as well, just a few minutes under a fan will be dry enough for a second coat. 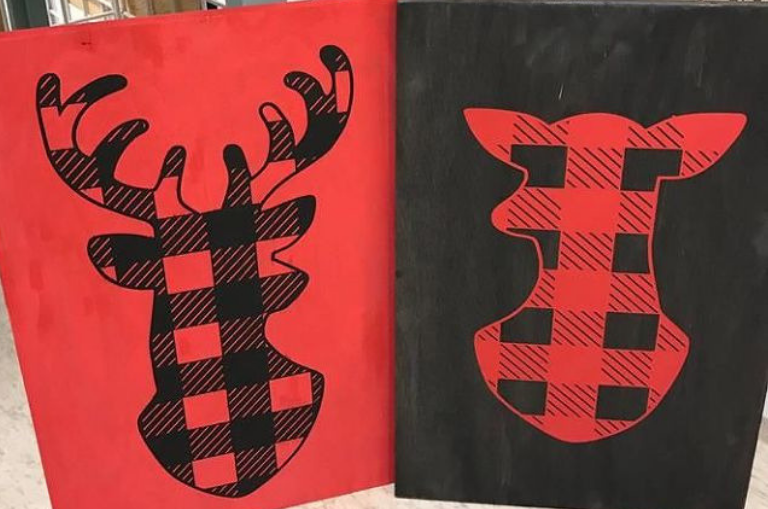 Once both coats are dry you can peel you stencil off. You will see very nice crisp lines as you stencil comes off, to see the deer head fully you must pick off all that extra vinyl stickers. Peel off the little pieces in the design, make sure not to gouge or scrape the wood. 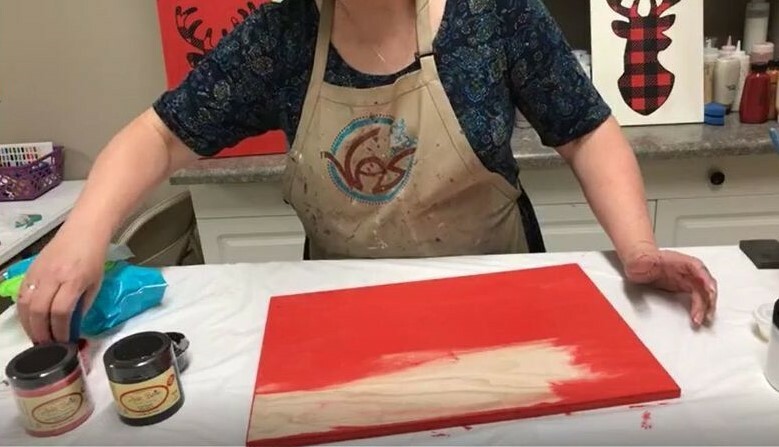 Usually we will put another thin coat of Top Coat to seal the finished piece, but this is optional because Dixie Belle Paint doesn’t not require a finish! Dixie Belle Paint was born out of the belief that creating beautiful timeless pieces should be easy, unintimidating and fun. Our line of chalk mineral paints has adhesive qualities designed to eliminate the need to sand, prime or prep. Just choose your favorite color from our palette of 64 stunning colors, clean your creation and start painting. No sanding, priming or sealing required! Your masterpiece will have a matte finish that can be distressed beautifully. What do you tell yourself? It's not all about seeing, it's also about feeling! Have you tried VooDoo Gel Stain to accent those little details? It's an easy way to really make those special features stand out! This nightstand was created as a team by Lilly Moon Vintage and her husband. Yes, and it is so easy! I really like this piece. The gel stain just made it!! 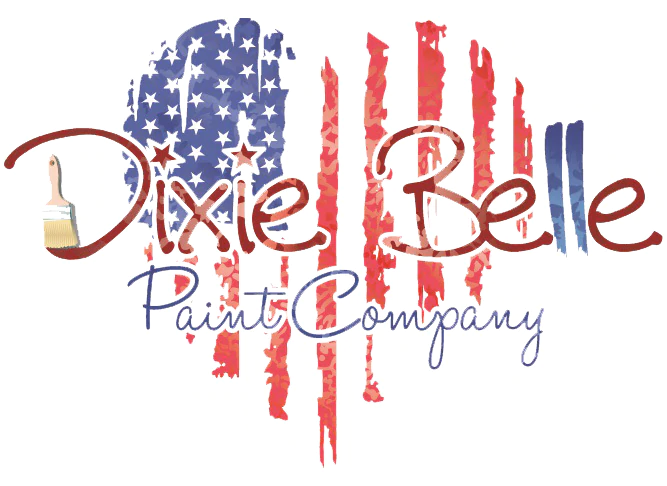 Stay up to date with the latest Dixie Belle Paint news!